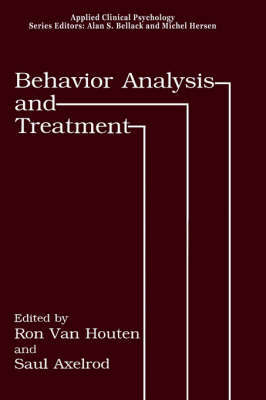 In May 1986, the Association for Behavior Analysis (ABA) established a task force on the right to effective behavioral treatment. The mandate of this task force was to identify and delineate specific rights as they apply to behavioral treatment. Impetus for this project came in part from the controversy over the use of aversive procedures, which some held had no place in treatment and, with evolution of the treatment process, were no longer necessary. In con- trast, others cited evidence that programs based on positive reinforcement alone were sometimes not effective in treating severe problems. These re- searchers and practitioners desired to ensure that clients and guardians be permitted to choose treatments that included punishment procedures when assessments warranted their use. The first editor approached Ogden Lindsley, president of ABA, about establishing a task force to examine this isuse. The ABA council decided to broaden the mandate to include an examination of clients' right to effective behavioral treatment in general. The first editor was asked to chair the task force and appointed Saul Axelrod, Jon S. Bailey, Judith E. Favell, Richard M. Foxx, and 0. Ivar Lovaas as members. Brian A. Iwata was appointed liaison by the ABA council.